It’s comfort food season in the Pacific Northwest, there’s no doubt about that. We plunged from the upper 90’s right down into the 40’s and we’ll be here for the next several months. When I look outside, I just see cloud…I live in a cloud. It’s pretty much what you think it would be like – drizzly. Moist. Hard to see when you drive because you live inside a cloud. So I’m seeking all the comfort food and I made you aÂ No Noodle Vegetarian Eggplant Lasagna with Quinoa and Spinach. I’m kind of obsessed with lasagna – I have some awesome lasagna rolls up on the blog – but this one is interesting because of the quinoa and eggplant. The flavors blend so well together and it has a really nice texture. We devoured it for dinner and then also had leftovers for work that I think will keep very well. Whenever I use marinara sauce it reminds me of my friends over at tomato wellnessÂ because they’re obsessed with all things cooked tomato because of the versatility and health benefits. Marinara sauce is particularly high in lycopene – an antioxidant that has unique anti-cancer effects, especially for prostate cancer. It also contains vitamins A, E, K and b-vitamins, and minerals likeÂ potassium and copper. Quinoa is a wonderful high-protein grain that I also often like to make for breakfast. Eggplants have some unique nutrients; whenever you see that blue/purple color you know that you’re getting the antioxidant anthocyanins. Eggplant also contains fiber, potassium and magnesium – as does spinach. I use lots of herbs in this dish, too for flavoring. You can definitely use fresh, too if you prefer. You know me, I’m all about easy and quick with my recipes. ThisÂ No Noodle Vegetarian Eggplant Lasagna with Quinoa and Spinach saved me all week with leftovers that were perfect for busy work days. I hope you’re enjoying your fall and that you get to try this awesomeÂ No Noodle Vegetarian Eggplant Lasagna with Quinoa and Spinach recipe! Slice off top and bottom bits of eggplant and cut into 1/4-rounds. Arrange on baking sheet then brush both sides with olive oil. Sprinkle lightly with salt and pepper then roast in the oven for 20 minutes. Bring quinoa and 1 3/4 cups water to a boil in a saucepan. Reduce heat and simmer, covered for 15 minutes. Turn off heat and let rest for 5 minutes. Transfer to a large bowl and add spinach. Blend together, cover and let rest for an additional 10 minutes. Meanwhile, whisk eggs and add oregano, basil and parsley. Add egg mixture to quinoa spinach mixture and blend well. Blend 1/2 the mozzarella and 1/2 the Parmesan into the ricotta. In a 13×9 glass baking pan, spread 1 cup of marinara sauce evenly. Layer half the eggplant slices in the bottom of the pan (about 6 large pieces). Spread quinoa mixture evenly on top. Dollop ricotta mixture on top of the quinoa mixture so it is spaced evenly around the casserole. Add another layer of eggplant on top. Cover with remaining marinara sauce then remaining mozzarella and Parmesan. Cover with foil and bake for 25 minutes. Uncover and bake for an additional 20 minutes. Serve hot. Also makes great leftovers. 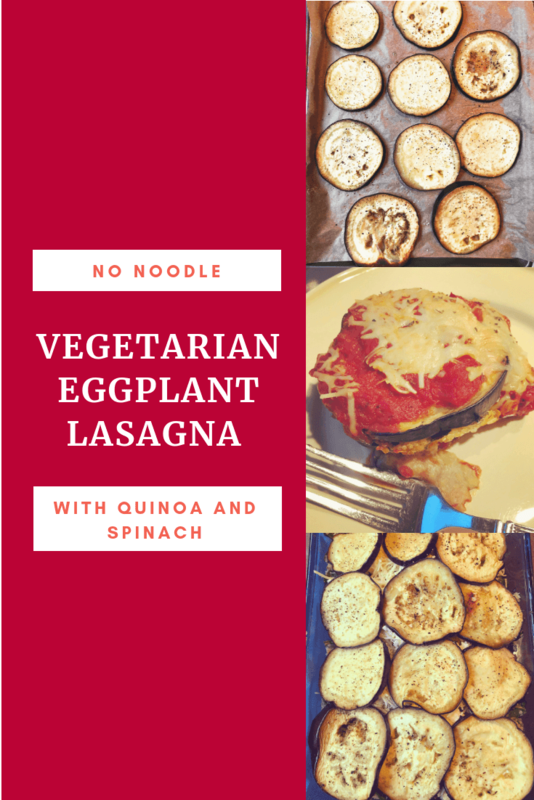 The post No Noodle Vegetarian Eggplant Lasagna with Quinoa and Spinach appeared first on Champagne Nutrition.